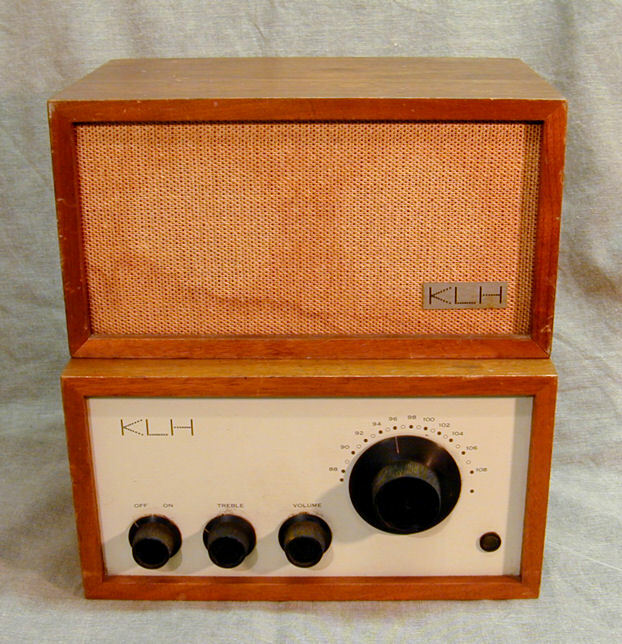 The KLH Model Eight (8) FM radio is a prized collector's item, scarcer than the Model Twenty One that succeeded it. Both were created with one goal in mind: to make the world's best-sounding FM radio in a compact tabletop cabinet. Designed by Henry Kloss and built in Cambridge, Massachusetts, the Model Eight was produced from 1960-1965. 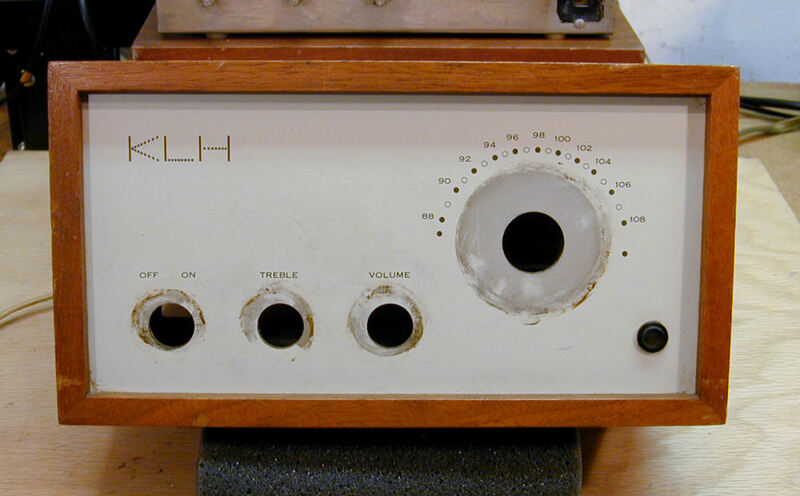 Kloss had earlier co-founded the Acoustic Research company, creator of the acoustic suspension speaker (a speaker sealed inside an air-tight cabinet). 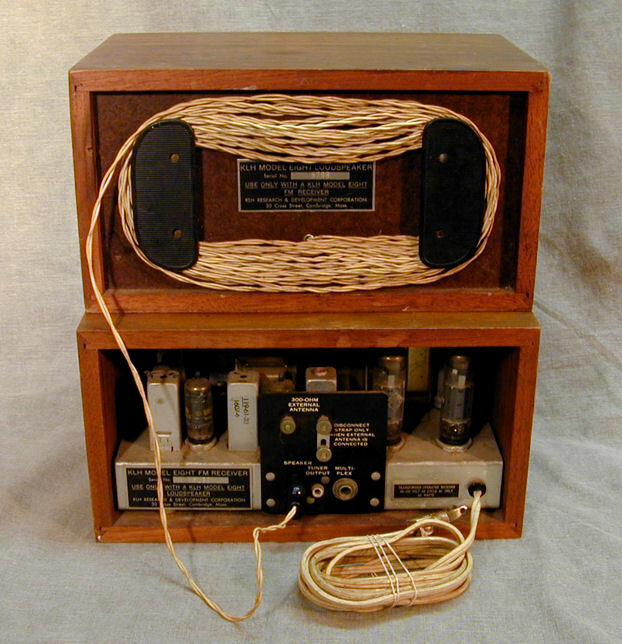 The Model Eight was Kloss's first radio. 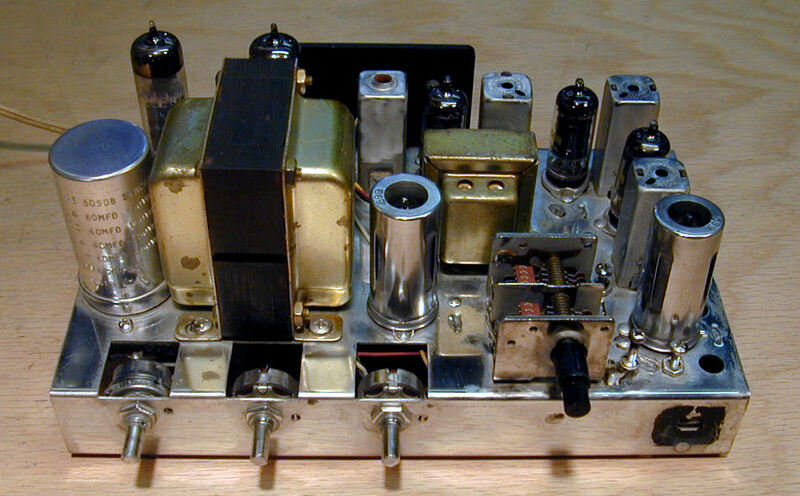 Using a transformer-type power supply, it has a hand-wired chassis. 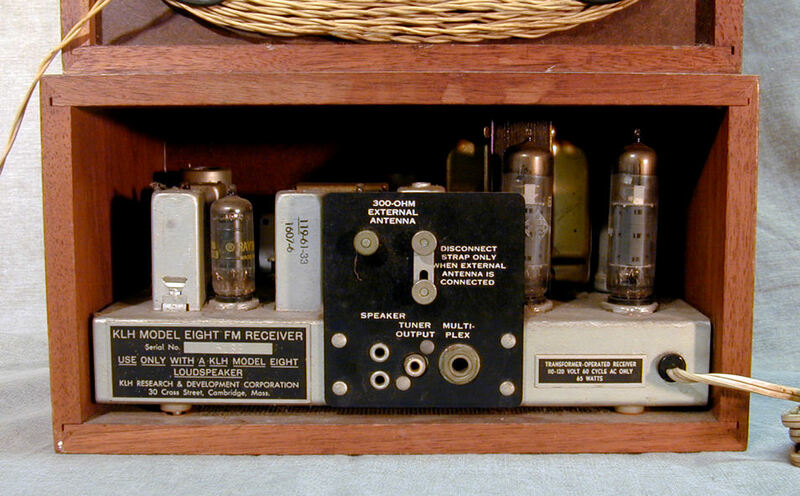 The Model Eight employs seven tubes (types 6U8A, 6BS8, two 6BM8, and three 6AU6A). This set produces amazing sound for a radio of its size. Mine sits in my office and I listen to it nearly every day. That's quite a testimonial from someone who owns a houseful of radios. Below you will find the Model Eight owner manual and schematic diagram. To save either PDF file on your computer, right-click on the icon and choose Save Target As. 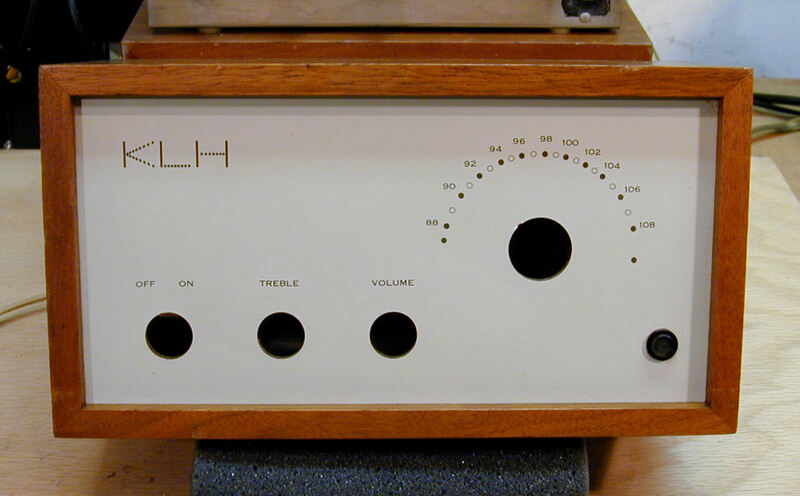 KLH factory literature is skimpy. If anyone has found a more detailed service manual, kindly send me an email. You can read more about the Model Eight's development and features in this article from Antique Radio Classified magazine. I found my Model Eight in a Craigslist ad in November, 2011. Here is the radio before I did any cleanup or restoration. The radio and speaker are in identically sized cabinets, which I stacked for these photos. The front controls are simple: power, treble, volume, and tuning. Notice the wood grain and corner joints in the rear cabinet views. These early Model Eight cabinets are made of solid walnut, while later cabinets are veneered wood. The radio's chassis is compact, with a few rear connectors. Two upper terminals let you connect an external FM antenna. 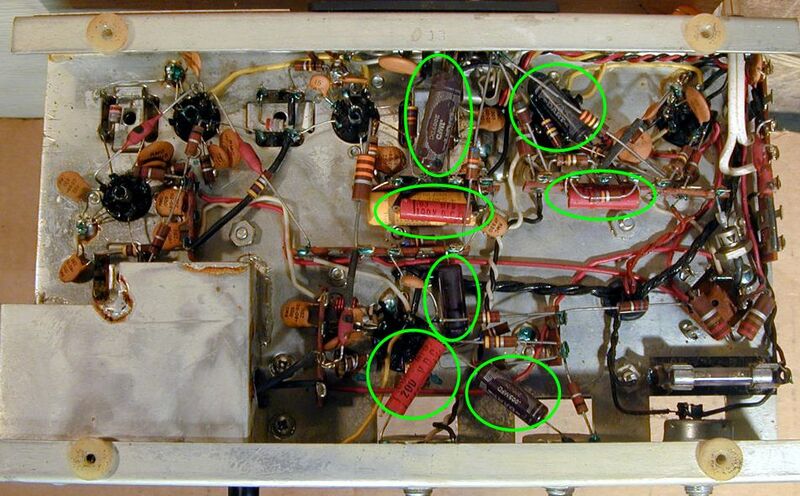 At lower left are two jacks for the speaker cable. 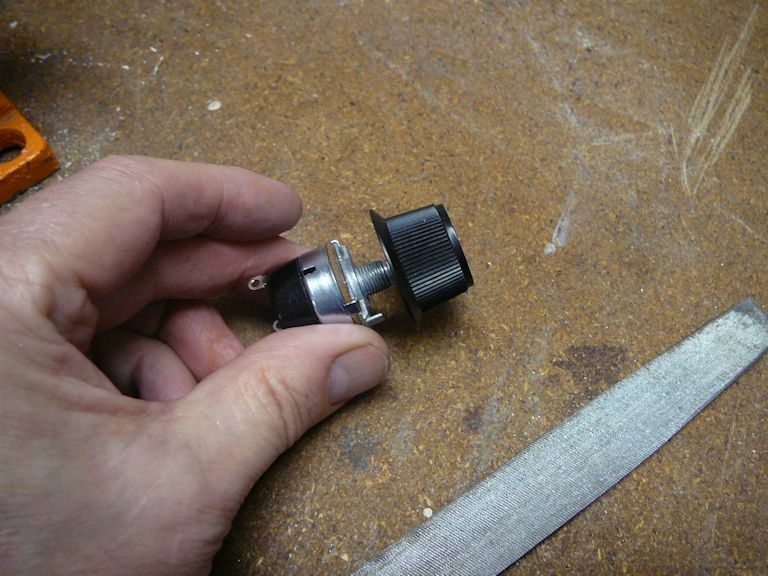 The tuner output jack can be used with an external mono amplifier. 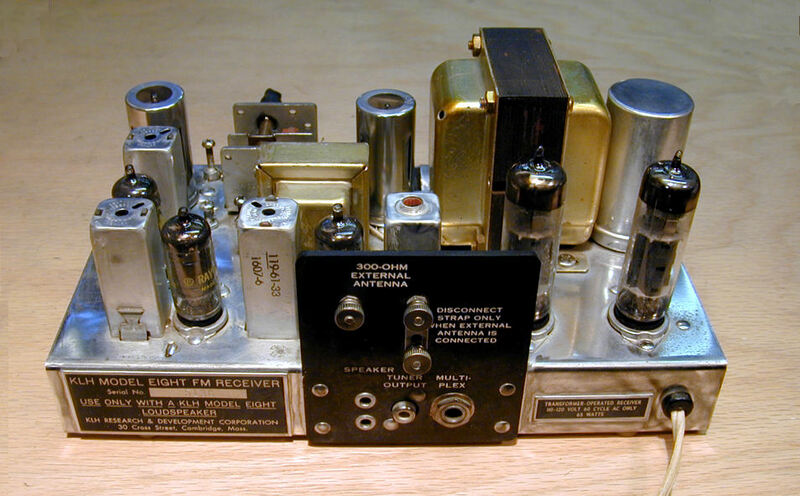 The multiplex jack is for use with an external stereo multiplex decoder and stereo amplifier. 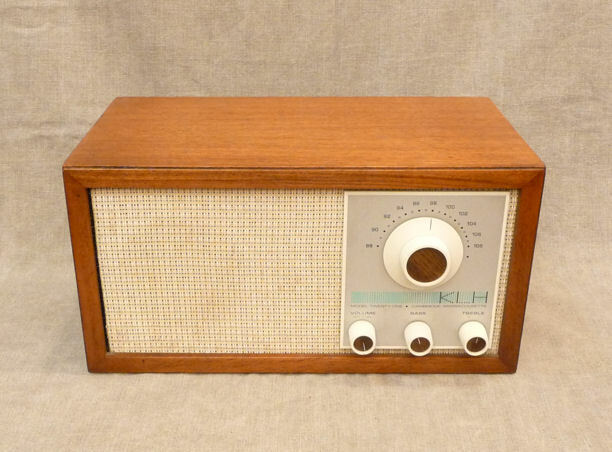 When I powered the unrestored radio using my variac, it worked surprisingly well, with good sensitivity, excellent tone, and no trace of hum (which would signal bad filter capacitors). The only defects were some scratchiness when turning the volume control and, less often, the tuner. These can be cured with electronic cleaner when I take the chassis out of the cabinet. 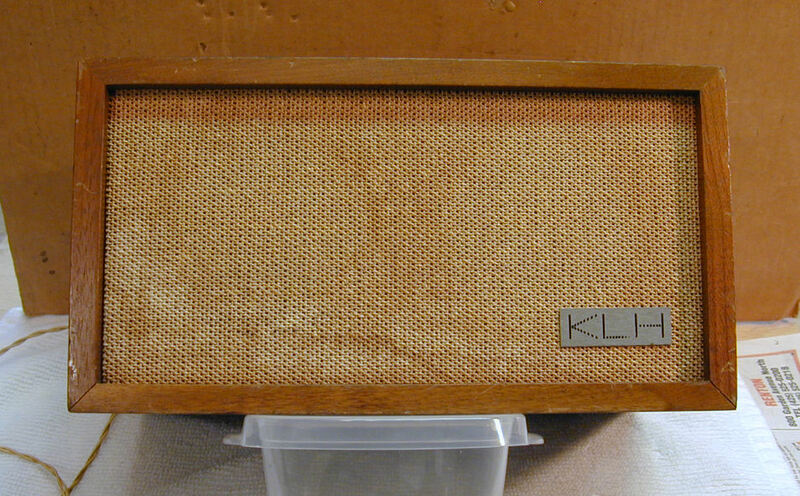 The cabinets are in nice shape, overall, but the speaker grille cloth has some serious stains. Let's begin with the cabinet exterior. After removing the chassis, I cleaned the front panel with Windex and a soft cloth. This is a painted Masonite board; don't scrub it with anything abrasive, lest you ruin the paint. The cabinets had only minor scuffs, so I concealed them by applying Howard's Restore-a-Finish to all the wood. Howard's isn't suitable for a badly damaged finish, but it works on minor flaws. Grille fabrics are not intended to be soaked, and there's no way to know whether this stain came from spilled coffee, alcohol, or something else. We also don't know what sort of dye (if any) was used in the original fabric. Notice the lighter appearance of the cloth over the speaker holes. Perhaps air moving through those openings kept dust from settling on those parts, while the rest of the cloth was glued to the board and collected household grime over the decades. 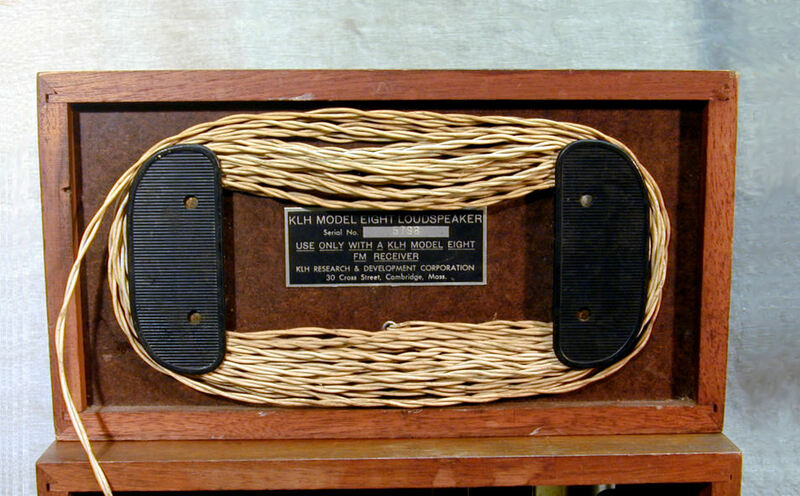 In many old radios, the grille cloth is lightly glued around the edges of a big opening, and with care, you can remove it for gentle washing. (I washed a grille cloth in my Admiral 24C15 TV project.) Not so with this cloth, which is glued to the mostly-solid Masonite speaker board. Trying to peel it off would likely destroy it. Nothing ventured, nothing gained. I began with clear, warm water, dabbing it on with a clean cloth and then pressing off the excess with another cloth. Following that, I left it under gentle heat from a lamp, to see how it looked after drying. The first attempt wasn't encouraging. Dabbing with water lightened the stain somewhat, but it also lightened the surrounding area, so the stain was still evident. I suppose the lightest areas on the cloth represent the original color. One approach would be to keep dabbing the entire cloth, until it had a uniform light color and the stain was reduced. I didn't keep dabbing because the cloth had begun to shrink. In the lower left side, you'll see a space starting to open between the cloth and cabinet, whereas the cloth is tightly pressed against the cabinet in other areas. The cloth was also loosening a bit in that corner. After the water treatment, I went back over the cloth with naphtha lighter fluid, a solvent that evaporates without residue, paying special attention to the darker areas. This lightened the stain so that the cloth looked presentable. Although my Model Eight worked in unrestored condition, I'll give it a routine electronic restoration to cure the effects of age and ensure trouble-free operation. The first phase in every restoration involves cleaning—both electrical and mechanical. You can read more about those processes in First Steps in Restoration. My Model Eight's chassis was covered with greasy dust, but not badly corroded. The view underneath was more inviting. No cleanup needed here. The build quality of this radio is admirable. The solder joints are very neat and every one was tagged with a green marker, possibly a quality control measure to show that it passed inspection. 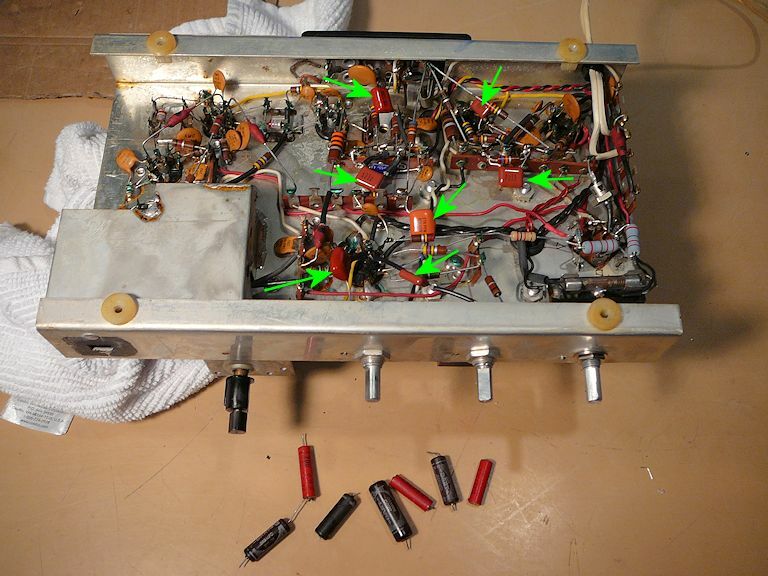 The box at upper right in the photo is the tuner cage, soldered shut to exclude dirt as well as RF interference. 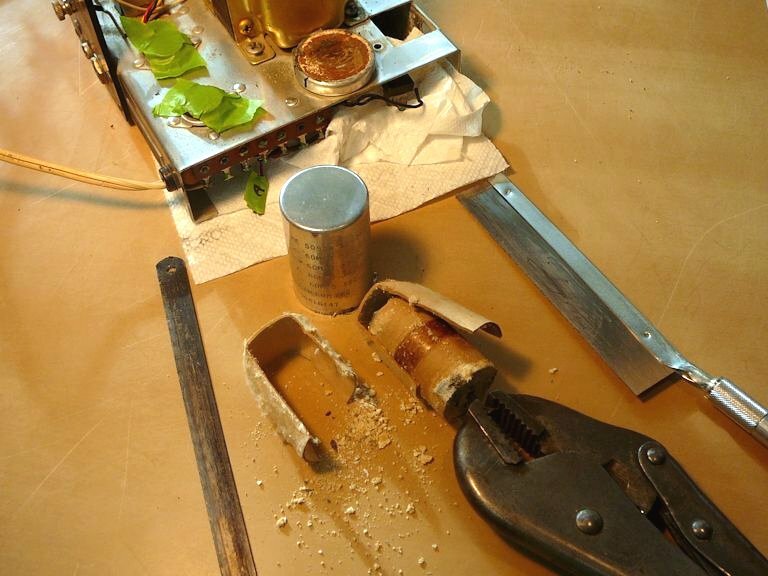 With the chassis tilted forward, I put a tiny drop of light oil into the ball bearing mechanism using a toothpick, and then turned the tuner all the way back and forth several times to spread the oil. I left the chassis tilted forward for a couple of hours to let a little oil migrate down into the vernier tuning mechanism. 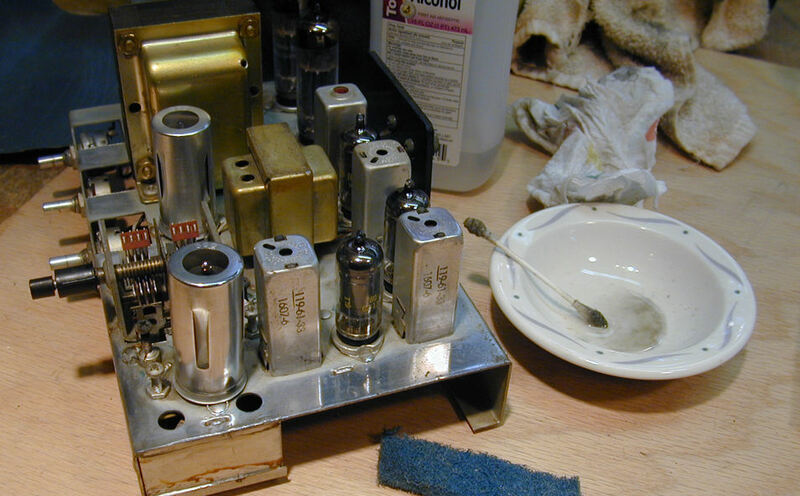 As with every restoration, I also cleaned every pin on each of the seven tubes and applied electronic cleaner to the Treble and Volume potentiometers. 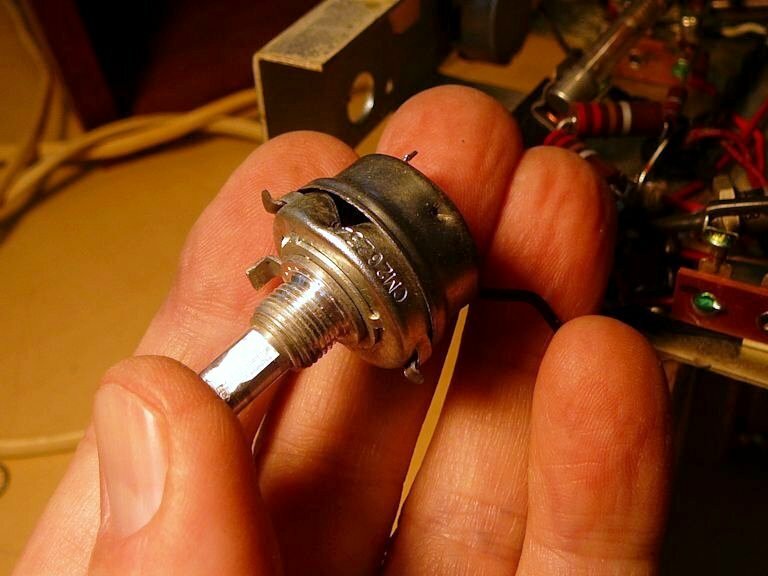 I let the radio sit overnight, to make sure all the electronic cleaner had evaporated inside the potentiometers. When I tried the radio, it sounded fabulous. The cleaning eliminated all noisiness from the tuner and controls. Cleaning the chassis took much longer. Its plating was oxidized as well as dirty. I began by mopping off dirt and grime with isopropyl alcohol, using rags, paper towels, and Q-tips. After that, I brought back the shine using metal polish and pieces of non-scratch plastic pads. I cleaned off the polish with damp paper towels and then polished with a cloth. This photo shows the chassis after I had done a strip near one end. Of course, the electrons whizzing inside the radio don't care whether the chassis is dull or shiny. I don't bother with chassis polishing in many projects, but the Model Eight is so nicely built that I like bringing it closer to its original appearance. 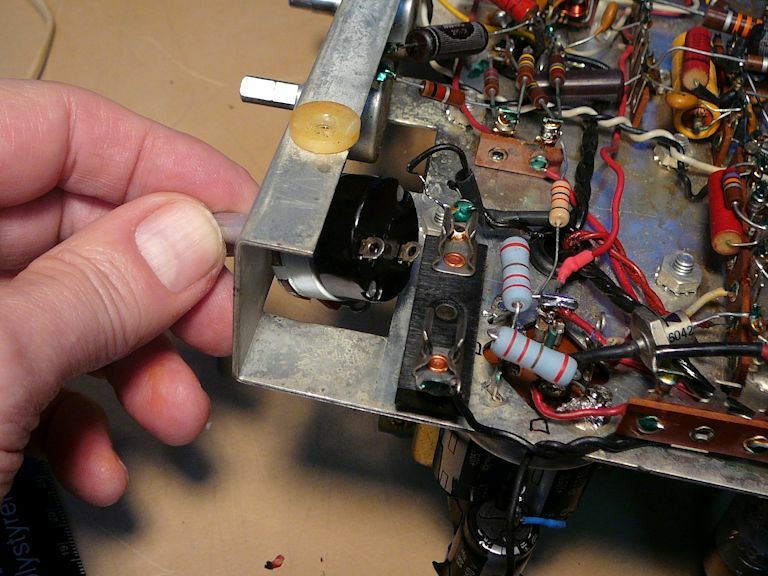 When restoring tube radios older than this, I usually replace the electrolytic and paper capacitors as a matter of course. 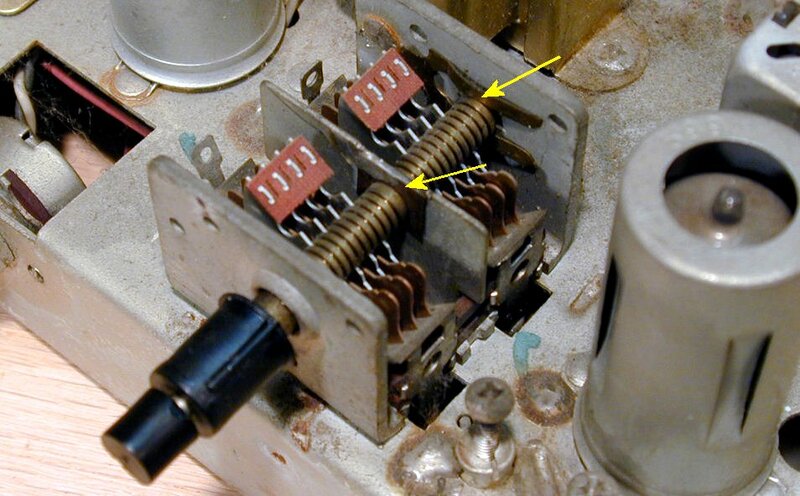 (For more about capacitor replacement, see my recapping article.) This 1960s set performed so well without restoration that I took a wait-and-see approach. When I checked key voltages, everything looked hunky-dory, so I decided to play the radio for a while. Everything was fine for a couple of years, but in 2015, the radio's power switch failed. While I had the chassis out for that reason, I also replaced the electrolytic and paper capacitors. 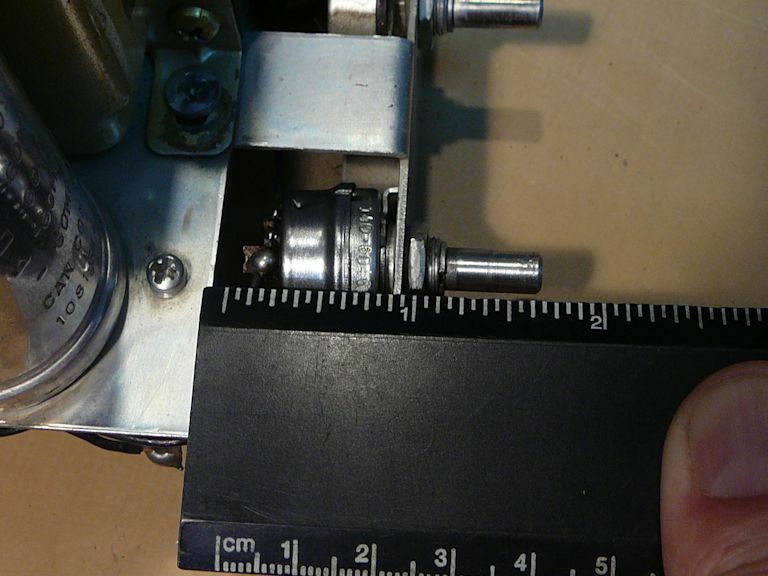 The power switch is a weak point in the Model Eight and mine had been flaky for a while. Sometimes, it would click into place normally. Other times, it refused to switch no matter how hard I turned the knob. It eventually quit working altogether, failing in the Off position, so that I couldn't turn the radio on and off by plugging and unplugging the cord (or installing a line switch on the cord). You'd think a simple rotary power switch would be easy to find, but this one was not. Most consumer radios combine the power switch with the volume control, and other equipment typically uses a toggle or rocker type switch. None of my usual suppliers stocked a plain rotary switch of the right size. The photo shows that a previous "repairman" tried to open the switch by prying apart its case with an awl or screwdriver. That bent the case but didn't open it, since it's held in place by two thin tabs bent over slots. You can see a dent in the lower half of the case, perhaps from gripping it in a vise or heavy plier. The flat portion of the shaft has also been rounded off, when someone tried again and again to force the switch to operate. 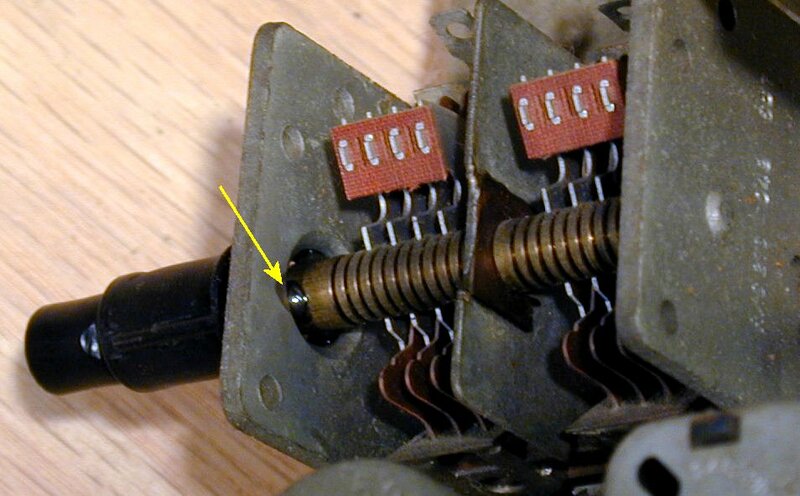 On eBay I found a replacement for the lower half of the switch (part 12), which contains the actuated portion that makes and breaks the electrical contact. 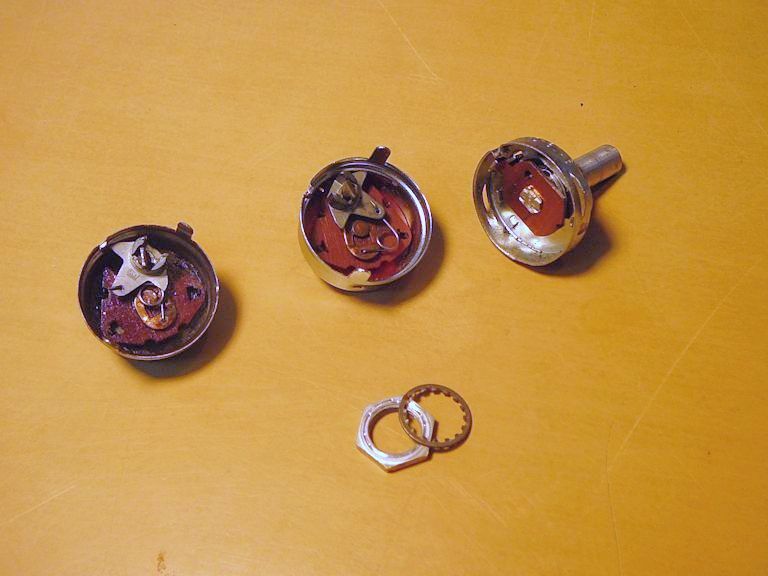 Here's a photo of the old and new parts, along with the upper half that holds the knob shaft. When I assembled the switch with the new half, it seemed to work outside the chassis, but every time I installed it in the chassis, it quit working. 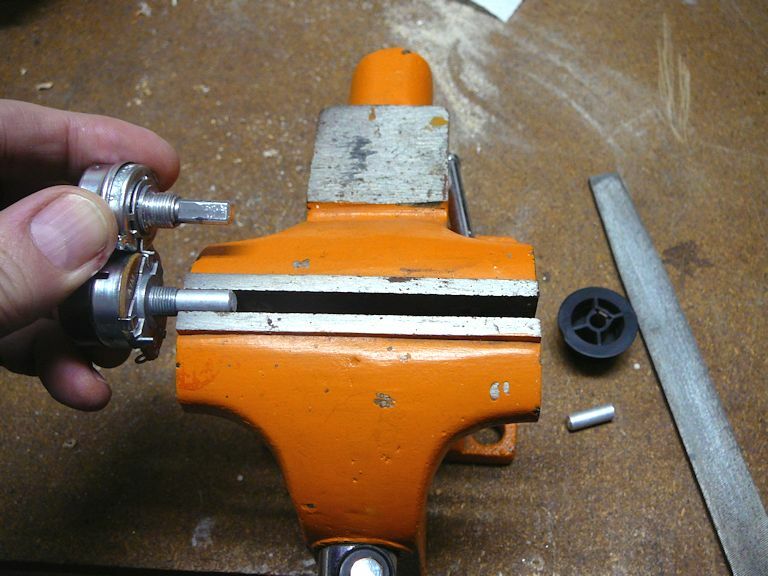 The actuated mechanism refused to click into place, no matter how hard you turned the shaft. After disassembling, checking, and reinstalling the switch a couple of times, I finally gave up on it. The flaw—whatever it was— seemed to be in the bent-up shaft portion of the switch, and for that I had no replacement. After some careful filing, the knob fit just right. In this photo you can see the control's two sections. The pot section is cased in metal and the switch is cased in black plastic at the rear. In the next photo, I'm slipping the new switch into place. It barely fits, if you first remove a screw from the fuse holder and slide it aside. Unseen on the opposite side of the control are the three potentiometer terminals, which will remain harmlessly disconnected. I disconnected those resistors and checked the electrolytics with my EICO 950B capacitor tester. They leaked! One of them had nearly short-circuited. No wonder that resistor had overheated. 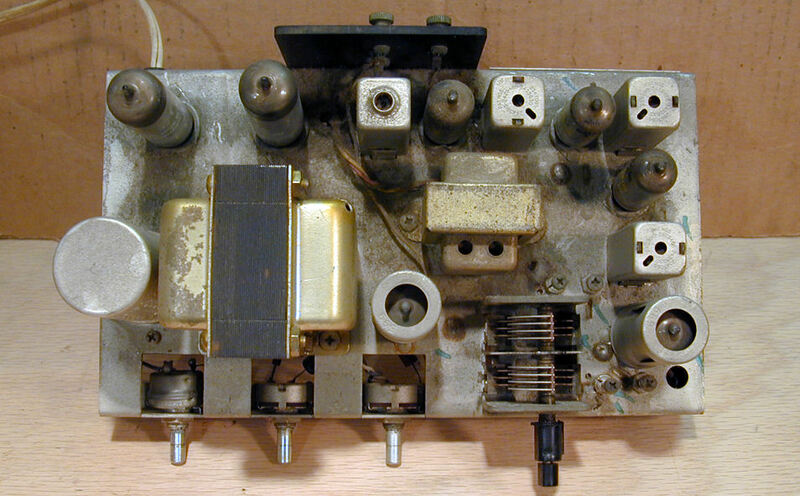 I knew I was pushing my luck by playing this radio with its original 53-year old electrolytics. It's a lucky coincidence that I detected the problem before one of them failed catastrophically and ruined the radio's power transformer. 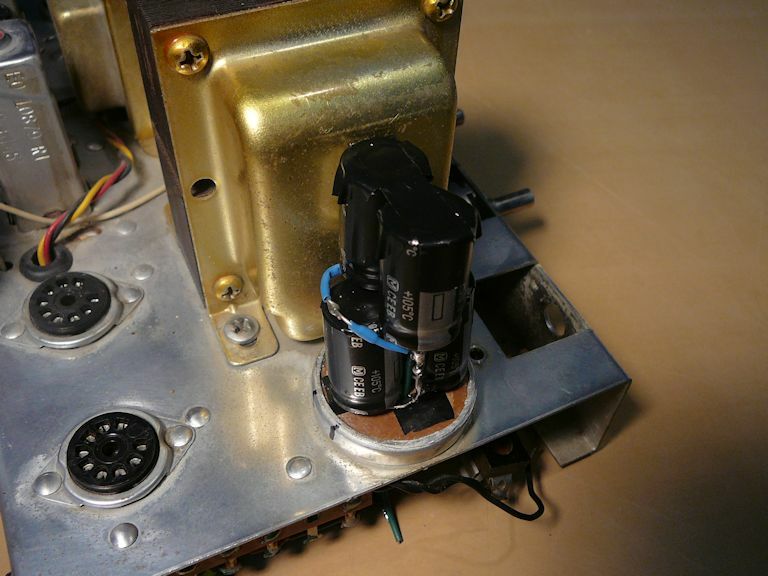 Other articles in this website document capacitor replacement exhaustively, so I won't bore you with details. I removed the electrolytic can in preparation for wiring four 60-mfd electrolytics onto its base. The next photo shows the dried-out innards that I pulled out of the old can. Notice the crumbly powdered junk on the workbench. 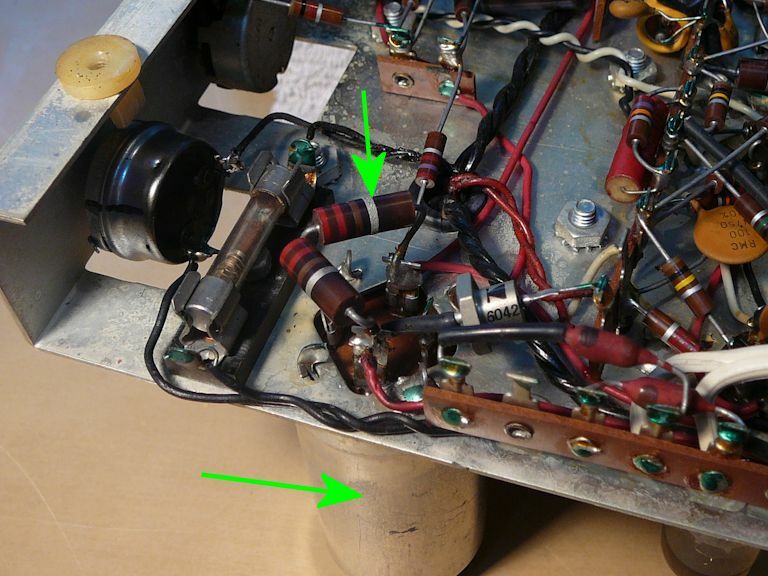 When this capacitor was manufactured 53 years ago, that powder was a moist paste that formed the capacitor's electrolyte. Now it is garbage, a certain sign that the capacitor has failed. The next photo shows the four new electrolytics stacked and wired with their leads going through holes in the can's base. After I confirm that the radio works normally, I'll glue the emptied can back over this assembly. While I had the chassis on the bench, I also replaced its one other electrolytic, a 5-mfd/25-volt unit. Low-voltage electrolytics don't typically cause serious problems in this type of radio, but better safe than sorry. 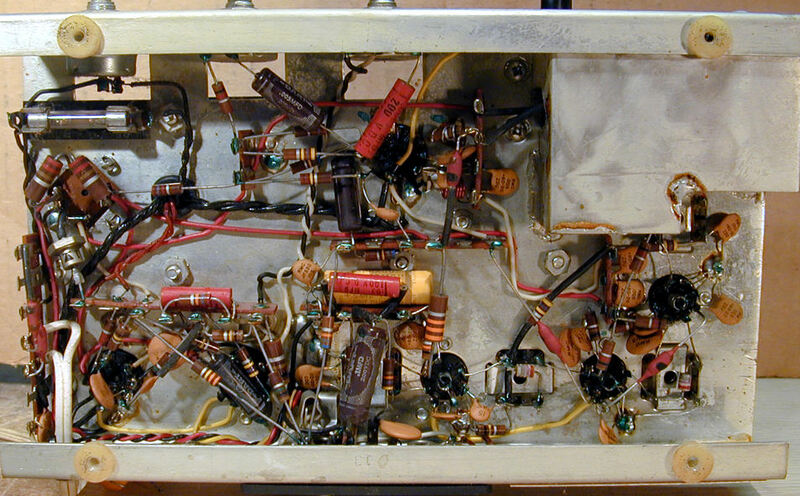 This photo shows the radio with the new power switch, resistors, and electrolytics wired in place. 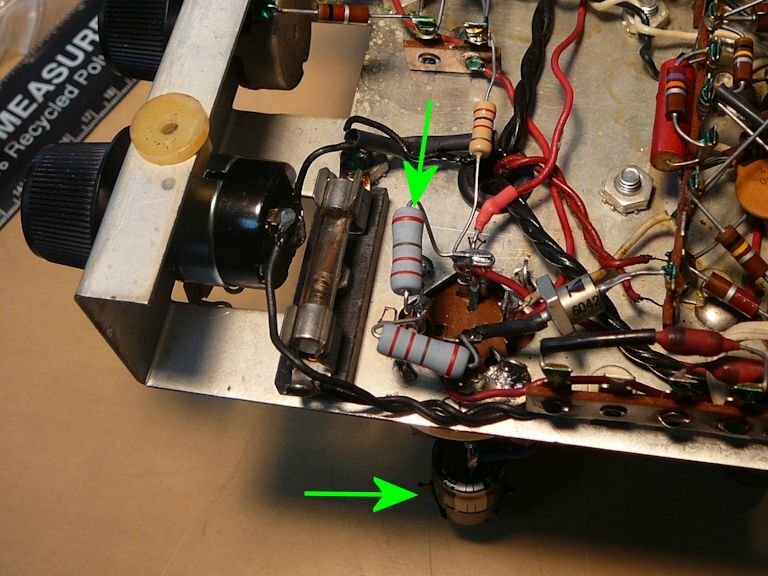 One arrow points to a new resistor and another points to the capacitor assembly, ready for the can to be reinstalled. The Model Eight has seven paper capacitors. Although they have plastic outer shells, these caps use paper inside as a dielectric material, so they become leaky with age just like paper caps in cardboard cases. I'll replace them all to preventu future problems. Now I have returned the Model Eight to its place of honor in my office, right next to my computer where I play it nearly every day. With luck, it shouldn't need further service for years. The Twenty One is a solid-state set with speaker and radio combined in one cabinet. It's easier to find (and often cheaper) than a Model Eight, but both models exemplify Henry Kloss's dedication to quality.